Serving the Tampa Bay area since 1996, West Florida Fence provides a number of options for both residential and commercial needs. The premier fencing tampa contractor in the area, we not only offer standard styles and sizes, but we can also custom fabricate fences and gates, including chain link fencing and decorative steel designs, to meet virtually any need. Whether it’s temporary fence in Tampa for a construction zone, or a custom chain link fence for your company headquarters, West Florida Fence can provide you with the products you need and the impeccable service you deserve. Plus, most of our products come with impressive limited lifetime manufacturers’ warranties. 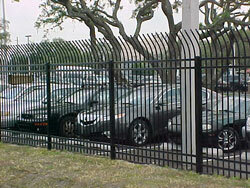 For more information on our fencing products and services, call or e-mail the West Florida Fence office in Tampa today. We’re happy to serve contractors, businesses and homeowners throughout the region.